We take pleasure in introducing ourselves as leading firm by offering Bolero Starter Armature. We are a unique entity in the industry, actively committed towards trading a qualitative range of Auto Electrical Armatures. Varroc brand armature assembly for 3W bajaj. Our organization is engaged in offering Mitsubishi Type Automotive Armatures in the market. Mitsubishi Type Automotive Armatures, offered by us, are available in various sizes and specication to suitvarious models ofstarters. This Three wheeler Self Armature is extensively demanded for fitting in vehicle for excellent performance. 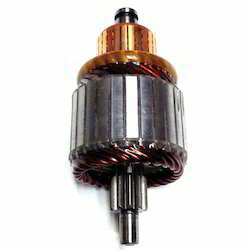 An armature generally refers to one of the two principal electrical components of an electromechanical machine–generally in a motor or generator, but it may also mean the pole piece of a permanent magnet or electromagnet, or the moving iron part of a solenoid or relay. We are offering three wheeler armature for ape. From past many years, we are actively engaged in offering Starter Armatures for Automobile Industry. This is stringently tested by quality controllers in order to dispatch flawless range at clients end. Our company has created niche in the field of offering 407 New Model Self Armature.